CAMWEST — Cyclepath, Bus Lane or Road Commuter Route? Feature — Cyclepath, Bus Lane or Road Commuter Route? 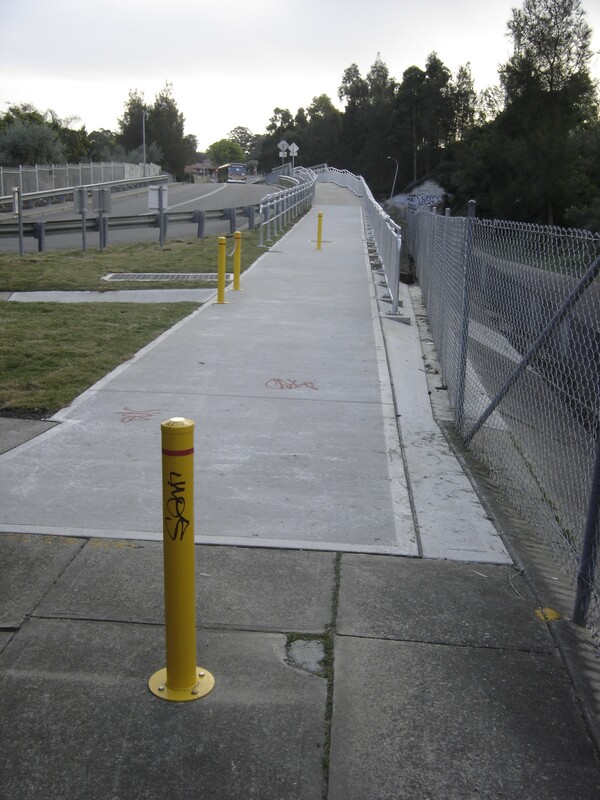 The completion of the T-Way cycleway across Findlayson Creek allows the opportunity to compare three modes of bicycle travel across a decent distance. 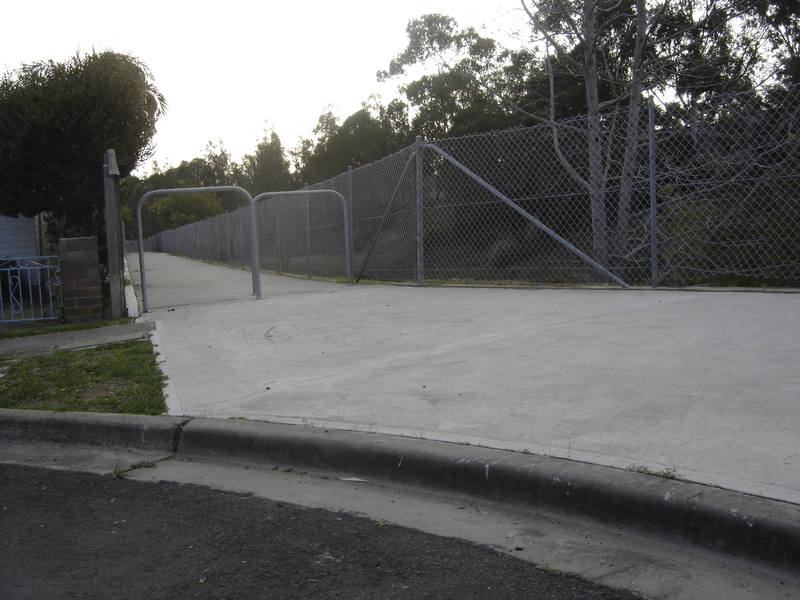 In order to travel from the Canal cycleway at Greystanes to Parramatta it is now possible to cover the entire route by off-road cyclepath, or by following the bus lane, or of course by using back roads. You are legally allowed to ride a bicycle in a bus lane. (where it is a bus lane, and not a bus only lane; and definitely not where it is designated as a T-Way lane) In many cases on these trips a left turn can be made easily, but the right turn on the return trip is difficult or illegal. For this reason, as well as the effects of wind and hills, each route possibility was tested for a return trip. The results may surprise you. The cycleway gives the rider the feeling of being safe from cars. After all, you are off the road. The major road crossings are all controlled by traffic lights. There are a couple of intermediate road crossings that can present a problem during peak hour as the roads carry large and continuous volumes of traffic. 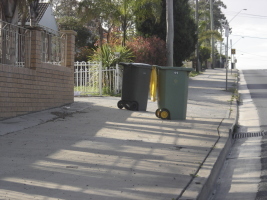 In particular, problems at the Burnett Street crossing have been brought to the attention of Holroyd Council. There are however a lot of hills and descents on the cycleway. Many of the descents have intersections at the bottom, creating a danger for inexperienced riders, as well as enforcing frustrating halts, and making high speed free-wheeling a waste of time. 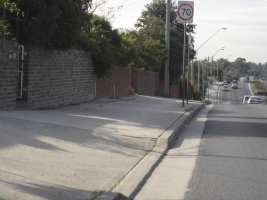 The descent in Pitt St is particularly hazardous, with speeds of around 50 kph being reached on the cyclepath, which is very fast if young pedestrians are in the area. Alongside the Cumberland Hwy in South Wentworthville, there are a very large number of blind driveways, where vehicles can reverse out without warning. For this reason the cycle speed is reduced, increasing the overall trip time. Much of the cyclepath is quite dirty with debris and there are often driveway formations making high speeds impossible. These factors combined to result in a much slower average speed. The greatest frustrations on this trip are the lack of priority given to cyclists at traffic light crossings, and the continual obstacles that slow the cyclist down. Pitt St from the Highway to Jones Park is a prime example, this is a beautiful downhill, but interrupted by no less than 4 minor road or lane crossings, resulting instead in multiple brake applications and a slow run down the hill, culminating in a dead stop to give way at Banks St and a right angle turn to join the next portion of the cycleway. Most lights are approached when red for the cyclists and a full traffic cycle is needed to allow the cyclist to cross legally. There are 2 intersections that need to be crossed diagonally, which takes even more time. The stationary time in the return trip tells the story — 9 minutes! The overall result is a frustrating and unsatisfactory travel experience. Safe but frustrating and slow. Here are some photos of examples of the obstacles you can expect on this cycle path route. Blind and bumpy driveway crossings. What’s the bus lane like? Where the speed limit in the adjacent lane is 50 or 60 kph then riding in the bus lane feels quite good. 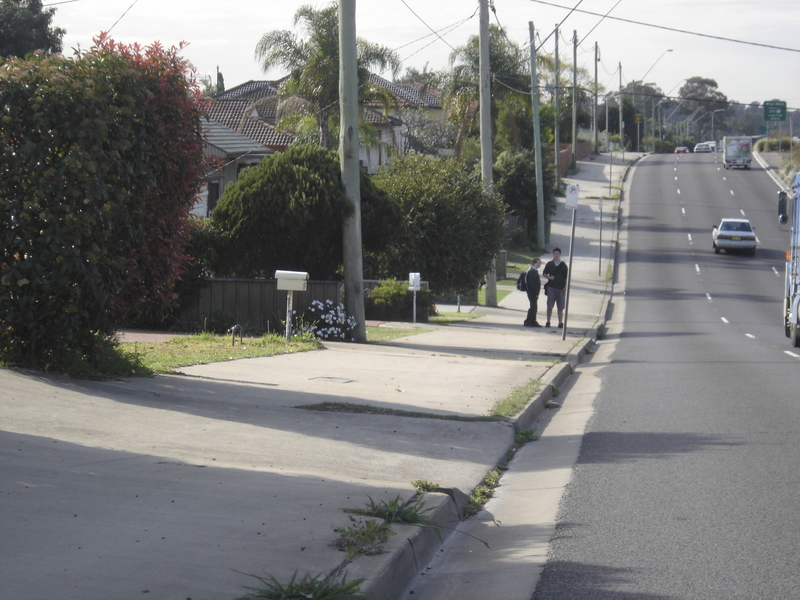 There is well over a metre of separation from the bike to the car lane. When the other traffic halts and you have your own lane then it’s fantastic. A short climb on the Gt Western Hwy where the speed limit is 80 kph feels quite dangerous. There is a wide footpath here and that looked very tempting, and when a bus approached from behind I had no hesitation in using it. Generally the bus lane gives a smooth uninterrupted ride, and the slopes are fairly gentle except for the climb up Pitt St when leaving Parramatta. The T-Way bus drivers accept the presence of a bike in ‘their lane’ quite well. Be courteous to them, and they’ll be courteous to you. They only demand that you clear the lane when the other traffic lane is blocked by congestion. There are one or two spots where the bus lane changes abruptly to a bus ONLY lane and cycles are legally excluded and must dangerously join the normal traffic lane. Each individual cyclists needs to decide whether to simply ride through these spots, or find a way around them. The worst spot, passing under the M4, is easily bypassed using the nearby cycleway to pass under the M4. Some motorists using the bus lane to turn left don’t fully know the rule allowing bicycles in the lane and feel unfairly blocked when using the lane to turn left. These motorists can drive too close behind the bike and some cyclists may feel intimidated by this. I found this happened on the Gt Western Hwy near Westmead. Civilised, safe for adults and surprisingly good. A commuter route is a route chosen to minimise the total trip time. It takes account of potential traffic priority, hills and general topography, and tight turns that may slow the momentum of the cyclist. It is generally a legal and safe route, I won’t risk my life just to get to the destination 10 seconds faster. A commuter route makes use of a combination of cycle paths, roads, footpaths, underpasses and bus lanes. It could also be called the ‘route of best advantage’. In this test the worst obstacles were major road crossings, so the commuter route looks to find points to cross the obstacles with minimal loss of time, and obviously join theses points together. This route seeks to minimise the time spent stopped waiting for other traffic and also minimise hill climbing. A commuter route can also be the most fun route as it maximises the advantages of a cyclist, being able to travel as a very fast pedestrian but still be able to legally use the road where that’s better. What’s the Commuter Route like? 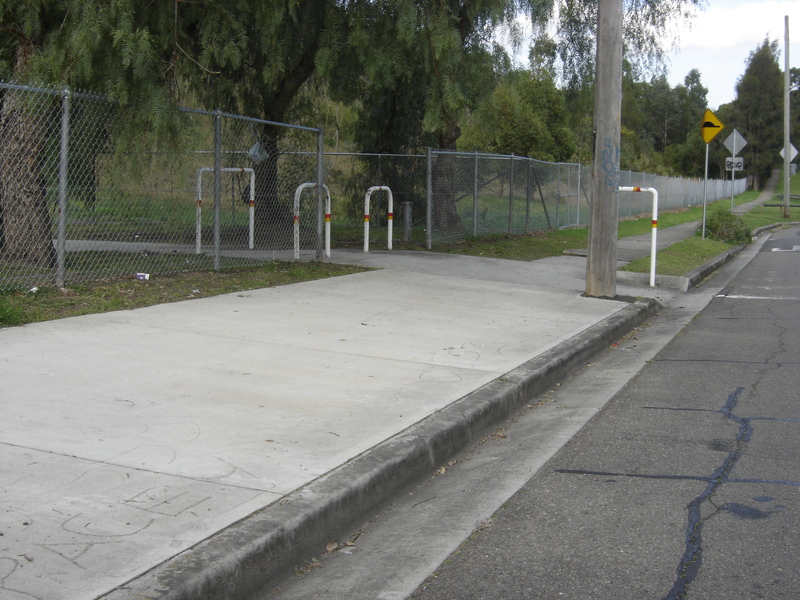 This route has a difficult road based stop sign to negotiate early on, as well as a place near Parramatta where the cyclist needs to join the traffic lane off the terminating cycle path. The stop sign can be bypassed with a short deviation that may actually be faster in very busy periods. I used the footpath for added safety alongside Church Street. Three uncontrolled intermediate road crossings present real problems in peak hour. Crossing the four lanes of Pitt Street in one go with fast traffic coming in both directions was a heart stopping exercise. These spots are fine just after dawn on a Sunday for recreational riders, but in weekday peak hours they are very busy and dangerous to cross. It is a route for road going cycling commuters experienced in dealing with medium and high stress traffic situations. 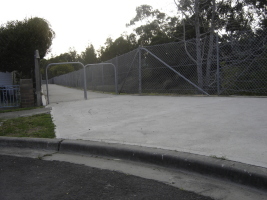 It starts with a short climb to get across the ridge between Merrylands West and Mays Hill, followed by a long and fast gentle downhill all the way into Parramatta, and a short climb up Church Street to access the station. The Cumberland Hwy is skipped by going under it, and Merrylands Road is crossed using lights with high pedestrian priority. Unfortunately, there is no way of getting under or over the Great Western Hwy, and so a major intersection is used where the cyclist is forced to join the general traffic by crossing a turning lane, which gets priority here. Entering this intersection was hazardous and time consuming. If I did this route daily I feel I could cut at least a full minute of the trip time in this one spot alone. This route is the most direct of the three, and feels less frustrating because of that, and because there are fewer enforced halts. Fewer kilometres, but a slightly slower average speed resulted in only marginally shorter trip time than the bus lane route. The outward trip is a long steady uphill grind for over 5 km and after a long day at work was a hard unrelenting slog. Fast and furious, perhaps too dangerous for daily peak hour use. You can take a tour of the three routes using bikely.com: press the Start Tour button, then use the grey arrow right button to navigate through the tour. It is a great shame the cycle path didn’t follow the topography of the bus lane or the commuter route. It’s faster and easier on the legs. The cycle path also needs more traffic priority to become a viable transport route. In it’s current form it will never be more than a recreational facility. The stationary time and average speed tell the story — overall it took 14 minutes longer than the next slowest route for a return trip and 19 minutes more than the fastest return trip. Cyclists looking for a safer way to commute than using the roads should look to the bus lane as an alternative before following the cycle path. If the 2 highest stress points on the road based commuter route can be bypassed, one with a detour, and one by using the footpath for a few hundred metres, then this route is probably the best for commuting, however the 2 intermediate road crossings cannot be detoured and create danger and delays. These detours would increase the safety and decrease the stress of the trip. The bus lane has one big climb right at the start of the homeward trip, compared to the commuter route that has a longer and steadier yet unrelenting climb. The overall height reached on the commuter route is also slightly higher. The overall result of this is that the return trip time for the bus lane route compared very well indeed to the direct road route. I was very surprised by the bus lane trips, particularly the outward uphill direction where it was only one minute longer than the commuter route. This underlines the benefit of using the gentle light rail style gradients of the T-Way for cycling routes. The bus lane trip produced a higher average speed. Also, because the bus lane crosses major roads at traffic lights there are none of the dangerous unassisted road crossings of the other routes, and these roads get quite good priority over the roads they cross. Although it is on on-road environment, on balance the overall trip is equal in safety to the off-road path for adults that know the road rules. If I was doing this trip 5 days a week then the bus lane would be my route of choice for the outward trip. However, this experience shows that the challenge of building a cycleway that equals the trip time of a reasonable road route to the same destinations is one that is beyond the road engineering capacity we have at the moment. This experience shows that a poorly conceived cycle path is no substitute for commuting on the road.